"I can't believe she took us to a brothel"
For a night that was meant to be filled with karaoke and plenty of alcoholic drinks, it went from excitement to confusion to just server hunger. Daniela, my partner in crime from college, was leaving our little college clique for a huge job as a fashion and lifestyle editor assistant at of Australia's biggest magazine publication. To say our farewells, the clique and I decided to go out of the night on the town in Parramatta. Since this was Daniela's night she got to pick where we go, so she chose a nightclub in Parramatta that featured karaoke. When we finally get there it was pitch black outside the club, expect for one small red light barely glowing through the window. Ben, our designated driver for the night, started bursting into laughter when he realised it's a club that turns into a brothel on certain nights - I can't believe she took us to a brothel. After spending five minutes laughing and shaming Daniela for her shocking choice of night time entertainment, we drove around in circles deciding where we should go to eat, I made the decision that we should go to Bondi Pizza Bar and Grill on Church Street, Parramatta. 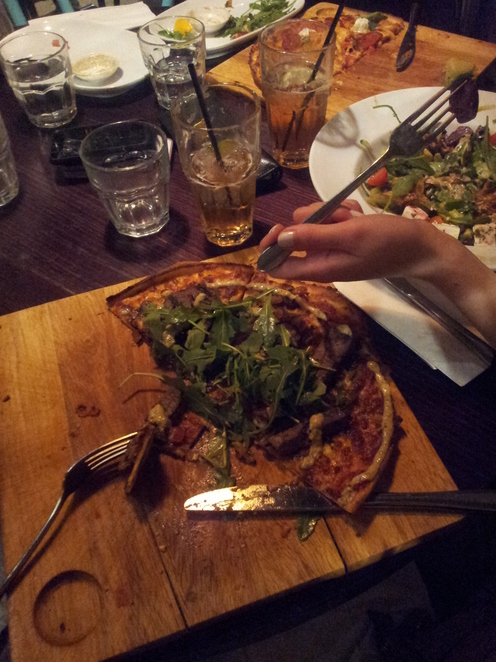 I absolutely love Bondi Pizza, it may be a bit pricey, but the pizzas are so worth it. When we got there, we were greeted by our friendly waitress, who showed us to our booth table which is the best because it's so comfy. After ordering my favourite food item on the menu, the Marinated Char-grilled Lamb pizza, I got my Frozen Pash cocktail, which was delish. From a crazy night of misleading information, fun and pure entertain from my clique, Bondi Pizza satisfied our hunger and ended our night on a high.